Helpchat & Zomato joined hands to make your food ordering simpler & faster! 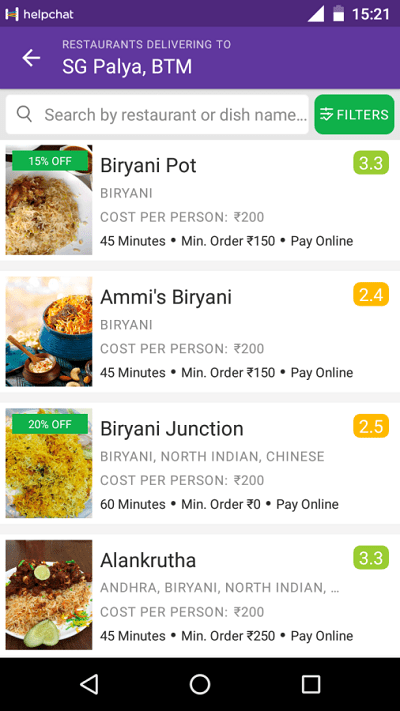 Bengaluru, July 13, 2016: Helpchat, India’s biggest personal assistant app has partnered with Zomato, the country’s leading restaurant discovery and food delivery platform, to make the food ordering experience simpler and faster for consumers. Through this partnership, Helpchat has integrated Zomato directly into their app. Users are now able to search for, and order food online via Zomato from within the Helpchat app. Helpchat personalizes the experience for its users, by understanding the user’s intent and helps them in completing the transaction right from the app. For example, it will contextually surface the food card besides the Match Score when users intent to order food is very high. Helpchat has passed on over 1,500 orders a day during peak times in June to Zomato. Food orders on Helpchat powered by Zomato have typically doubled on days when there is an important events like cricket match. With this partnership, Helpchat has come closer to its objective of being a personal assistant app, that helps in fulfilling diverse set of needs for it’s users. By entering into such a partnership with Helpchat, brands are able to significantly reduce their customer acquisition cost. With this partnership Helpchat will be able to anticipate users’ food-related needs and will suggest the best places to eat and help them in ordering food based on personal preferences. Currently, Helpchat has over 1.5 million downloads on android and iOS platforms.